The American Association of Publishers released their latest "monthly" Statshot report today and the news is generally good. The publicly available details were thin in this latest report, which draws from the reported net revenues of 1,218 publishers. According to the AAP, trade publishing sector revenues grew by 6.5% in the first quarter over the same period past year. Downloaded audiobook sales grew by 24.8%, continuing their steady rise, while ebooks increased by 5.1% (from $385 million to $404.8 million). Turning to categories (as opposed to formats) the adult segment saw a 1% decline (from $1.01 bllion to $1.0 billion), while religious presses grew by 1.8% (from $134.3 million to $136.7 million). Children's and YA books saw the best performance of the categories tracked by the AAP, increasing an impressive 31% (to $411 million from $312.5 million). 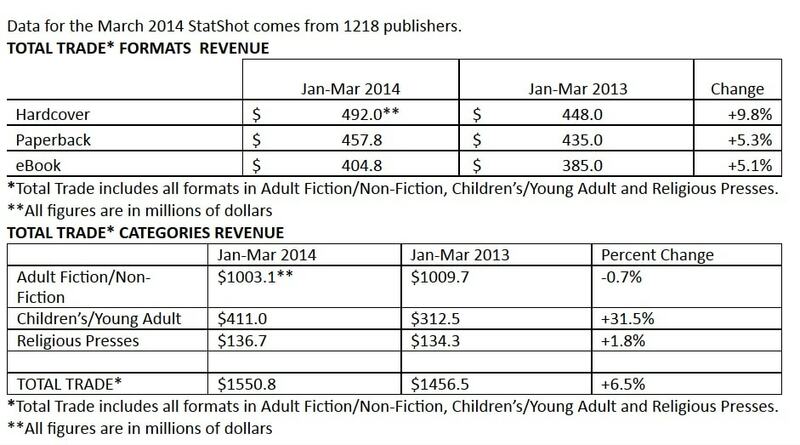 The latest revenue stats represent a marked turnaround from last year, when the overall book market was down 5%. I have fewer details this time around, but last year at this time the children's and YA segment was down 31% in terms of both print and digital - largely as a result of the 2012 sales bubble caused by the release of the Hunger Games movie. In 2014 we are seeing a bump in the children's and YA segment similar to what was reported in 2012. This too is very likely due to the release of the latest Hunger Games movie, which came out in late November 2013, and that detail is worth keeping in mind when that segment craters in the first quarter of 2015. The chart below sums up the statistics shared by the AAP today. The overwhelming majority of self-published authors are making nothing more than hobbyist money. Chances are if you put a book on Amazon few besides friends and family will buy it and it will sink like a stone. It’s simple math and I know most authors are living this life and not that thrown out by the self-glorifying crowd.